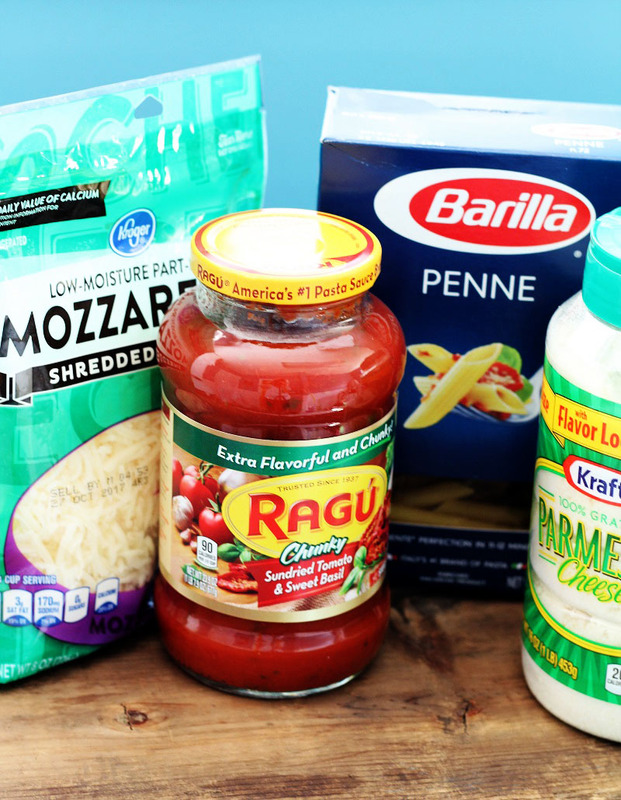 Easy Pasta Bake is perfect for those busy back to school nights! You will be able to put this dish together in about ten minutes and on the table in 30 minutes. Don’t you just love that! It comes together so quickly, even a younger child can make it. The summer is almost gone and kids will be headed off to college. This will be one recipe that they should take with them because they will be able to put it together. Five simple ingredients, and you have a delicious dinner. Too bad I already made it once this week, or I would make it for dinner tonight! I am sure that most of the collage students out there need this recipe, as well as all of you busy moms. It seems when the weather gets nice the days just seem to fly by and there isn’t quite enough time to get everything done. However some of the battle with cooking is trying to come up with a dish that everyone is willing to agree upon. 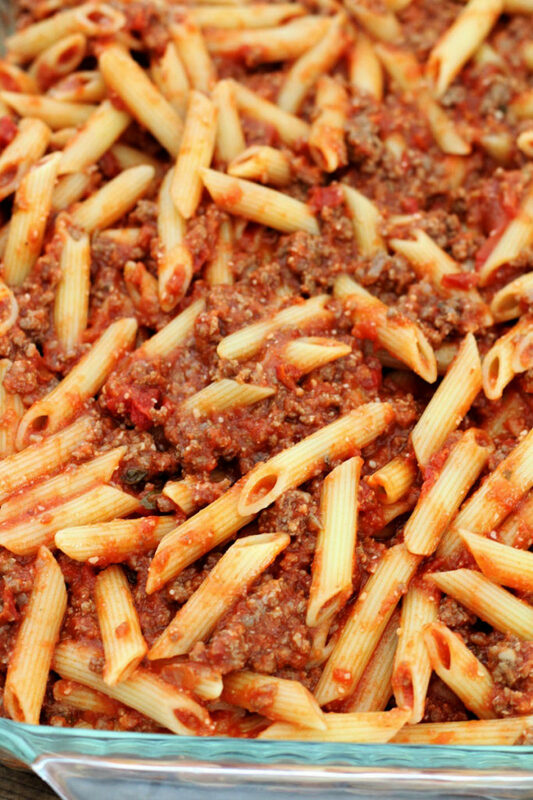 There are not too many complaints about this dish, even from your most picky kids. 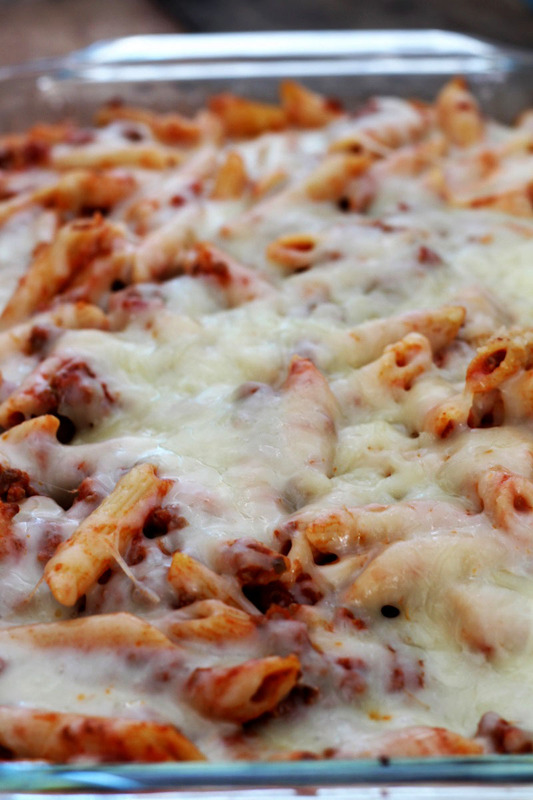 I know that you can make anything better with cheese on top. Right? I was thinking that I need to hurry and do something fun with my family before summer is officially over! We haven’t gone swimming or camping. We did stay in a tent when we went to my brother-in-law’s for a reunion, but I miss going in the mountains. However I think I am too chicken to go in a tent. What can I say; there are wild animals out there! And since I don’t have a trailer, I guess I will have to stay in my nice comfy bed! Shucks! But I need to plan a play day of some sort. What do you all like to do for your summer fun? I heard a story the other day and it reminded me of my years of growing up on a farm. There was a young boy about the age of 12 and his father told him to plant the grain. He told him how to run the tractor and to keep his eye on something at the end of the row so that his rows would be all nice and straight! About an hour later his dad came back, and to his surprise the rows were wavy and crooked! The dad asked his son why the rows where so crooked, and the boy replied, it’s not my fault dad, that cow kept moving. Ha ha! That is how I feel on my diet lately. I have a goal and I try and keep my eye on the goal and my target just keeps moving. It’s not my fault that these amazing recipes just keep popping into my head and then I make them and you all know that I have to try them. I do not want things on the blog that don’t taste good!!! Anyway, this Easy Pasta Bake was very good and I hope that it will make your life just a little easier. Enjoy. 1- Use any kind of spaghetti sauce that you enjoy. 2- Add black olives if you enjoy them. 3- You might also want to add mushrooms to your ground beef when cooking it. 4- For color, when you take the easy pasta out of the oven, sprinkle the top with dried parsley. Add the onion,pepper, salt and the garlic powder. Then add the spaghetti sauce to the meat mixture. When the noodles are finished, add them to the mixture. 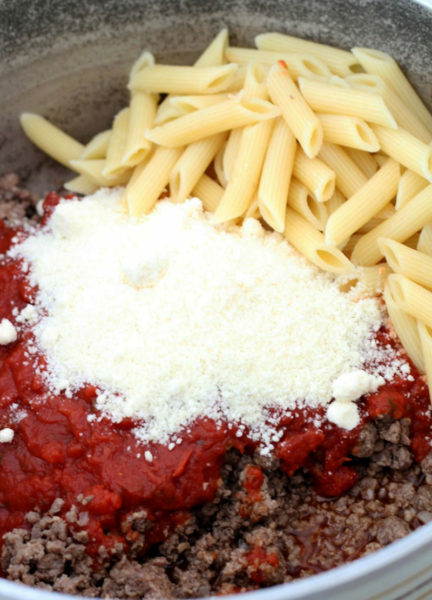 Next add the parmesan cheese and 2 cups of mozzarella. Add the last ½ cup or more of cheese to the top of the mixer and let simmer for 10 minutes. Or I like to place it into a greased 9" x 13" pan and add the mixture to the pan, then add the remaining cheese on top. Cover loosely and place in a 350 degrees oven for 20-25 minutes or until the cheese is melted and the center is warm.